"Before I knew much about food or dining out, I knew that if they brought shrimp cocktails to the table as an appetizer, we were eating at a 'fancy' restaurant. I'm sure I enjoyed the shrimp, but what I really loved was dipping the crackers in the spicy, horseradish-spiked cocktail sauce." Stir water, onion, lemon, garlic, tarragon, seafood seasoning, peppercorns, and bay leaf together in a large pot; bring to a simmer and cook until flavors blend, about 15 minutes. Whisk ketchup, chili sauce, horseradish, lemon juice, Worcestershire sauce, hot sauce, and salt together in a bowl; refrigerate until chilled, at least 15 minutes. Bring poaching liquid to a rapid boil. Cook the shrimp in the boiling liquid until they are bright pink on the outside and the meat is no longer transparent in the center, about 5 minutes. Transfer shrimp to a bowl of ice water and immerse in ice water until cold; drain. 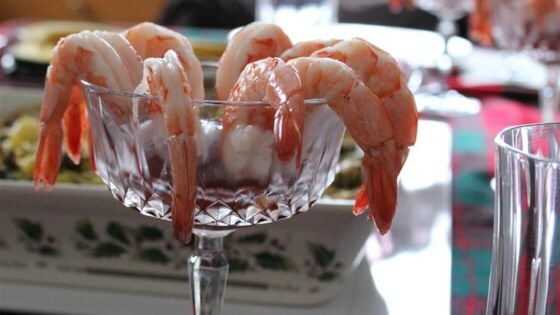 Arrange cold shrimp on a platter and serve with chilled sauce. A vibrant, tangy seafood cocktail full of Mexican flavors. This was a fantastic way to season up shrimp. I've never done this before and now I will always season like this. Perfect flavor and the recipe was right on. I wasn’t impressed by all the work it took boiling the shrimp as it didn’t seem to change the flavor at all. I loved the cocktail sauce although I would not put as much horseradish next time. This was awesome. I made one change and used beer instead of water. I have always cooked my shrimp in beer and old bay but the added spices really elevated the taste. This IS the best way to prep shrimp fpr simple shrimp coctail. Whole family loved it. Even my dauaghter-in-law said it was the best she ever had!! Made these for Christmas Eve. Forgot to rate. The boiling broth makes this a HUGE success. Bravo Chef John. Happy to know the secret to fresh and tasty shrimp cocktail.